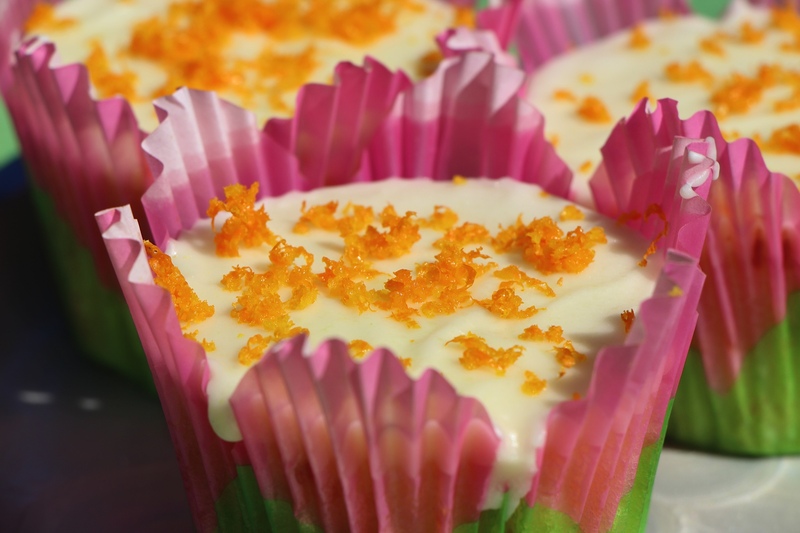 The addition of ricotta makes these cupcakes a moist delight! These have become our go-to cupcakes for any occasion! Preheat oven to 350° F. Place rack in middle of oven. In a medium bowl, combine flour, baking powder and salt. Stir to combine. In a stand mixer, or using a handheld electric mixer, cream the butter and sugar together for 3-4 minutes. Add the ricotta and cream an additional 3 minutes. While the mixer is running, add the eggs one at a time. Once the eggs are incorporated, add the half of the zest, milk and vanilla. Combine well with the mixer on medium. Add the dry ingredients by thirds, until just incorporated. Place paper baking cups in the muffin tins, and fill with the batter 2/3 of the way up. Place muffin tins in the oven. About 12 minutes through, rotate the tins to ensure even baking. Finish baking for another 12-13 minutes or until a cake tester comes out clean when inserted to the middle of a cupcake. Remove from oven and let cool for 10 minutes in tins. Then transfer the cupcakes to a wire rack to cool completely. While the cupcakes are cooling, combine the hot water and butter in a medium-mixing bowl. Stir until butter melts. Add the Orange Juice and icing sugar, and stir to combine thoroughly. The icing should be lump free. Once the cupcakes are completely cool, drizzle the icing over and sprinkle with decoration of your choice! (The picture has orange zest, but you can use sprinkles etc) The best way to avoid a messy clean up is to get a sheet pan and line with parchment paper or paper towels. Place the entire cooling rack with cupcakes on top onto the sheet pan to catch any wayward icing.